Ride with confidence and even better balance, when you use the Free Rider Western Safety Stirrup! I have been a horse professional in one form or another for the past 15 years. In 2009, I had the misfortune of being bucked off a horse and dragged while riding in the mountains near my home. I was lucky, I survived. My wife searched for a safety stirrup for me that would match my saddle and help get me back into the saddle with confidence and peace of mind. She could not find one that was affordable and had the aesthetic I wished to maintain in my tack. I came up with the design concepts of the Free Ride Western Safety Stirrup and with the help and input of my partner and dear friend, Robert Oaks, we are able to offer a high quality and effective product that will greatly reduce your chances of being dragged should a rider fall or be thrown from their horse. Our Free Ride Western Safety Stirrup is a good looking western safety stirrup that greatly reduces your chance of getting your foot caught in your stirrup and being dragged in the event you fall or are thrown from your horse. The Free Ride is cast with aluminum alloy 356, heat treated for strength then tumble finished and bead blasted for a uniform finish. We then install a wrap around non slip rubber foot cushion for comfort, an EPDM peacock with a latigo keeper for safety release and finish them with a customized leather keeper that we monogram at no additional charge! All this at an affordable price while maintaining the aesthetic that is SO important to western horsemen and horsewomen. Our Western Safety Stirrups are designed, manufactured and assembled in the USA using American materials and labor. No outsourcing is used in the production of our truly American product. You deserve the confidence and peace of mind our quality American made product delivers with every ride! Do I Get To Customize The Design? YES! We offer several levels of customized options for your new Free Ride Western Safety Stirrups! Our standard price includes up to 5 letters of monogramming on the leather keepers along with custom stamp embossing on the two bottom corners of each keeper. We also do custom stamp embossing on the leather concho at the top of the keeper. All this is included in our $175 price! NOBODY else offers ANYTHING like this in any stirrup never mind in a safety stirrup! We also offer custom carving of the keepers for an additional fee. We have carved people’s brands and business logo’s as well as traditional western and Celtic designs. Several examples are shown on our website. Is It True That The Western Safety Stirrup Also Helps Women With Balance? The answer is, YES it does! The Free Ride Western Safety Stirrup naturally hangs at an angle that allows a woman’s foot to make good contact with the proprioceptive point associated with her little toe when riding. This extra contact, along with the Free Ride’s safety aspects, can greatly improve a lady rider’s confidence and peace of mind. Of importance to note is that this angle will not adversely effect a man’s riding but actually ground him better! How Is The Free Ride Western Safety Stirrup Better Then Other Western Styled Safety Stirrups Currently On The Market? There are several advantages to our stirrup over anything that is on the market. First of all, our design is totally non mechanical and there is nothing to “wear out” or get stuck or malfunction. Our release system is based on the time proven rubber peacock but with modern materials (we use ozone protected EPDM rubber for our peacocks) and an aesthetic leather keeper that maintains a western style while helping to prevent accidental hang ups (such as brush, arena fences, etc) as can happen with other designs. The Free Ride body is heat treated and strengthened cast aluminum. NOT plastic! Our footpad is non slip rubber so your foot doesn’t slide around within the stirrup regardless whether it is wet or dry. Our stirrup is NOT a break away and stays attached to your saddle! No misfires or malfunctions. Ride with the confidence that even if things get a little “western” , your stirrup will be there where it belongs…on your saddle and accessible to our foot! Even without the EPDM rubber peacock, the Free Ride is a fully functional, comfortable and safe stirrup! Plus, we are 100% Made in the USA! Other Western Safety Stirrups Are So Expensive, Are The Free Ride Western Safety Stirrups Affordable? We feel strongly that our Free Ride Western Safety Stirrup is the best deal out there for both quality and price. We purposely set out to design and build a dependable western safety stirrup that is affordable for just about any rider out there. Our price for fully customized stirrups delivered to your door within the lower 48 states is $175! We do NOT charge extra for shipping! Compare that to the $350-$500 price tag plus shipping on some of the other options out there or the plastic foreign made products offered by others. Each pair of stirrups are hand made by US craftsmen from the ground up! Each pair are unique to their purchasers with up to 5 letters of monogramming, numerous embossing options and custom carving available. Not only will your new Free Ride stirrups reflect your personal preferences and tastes but they will do so at a very reasonable price! 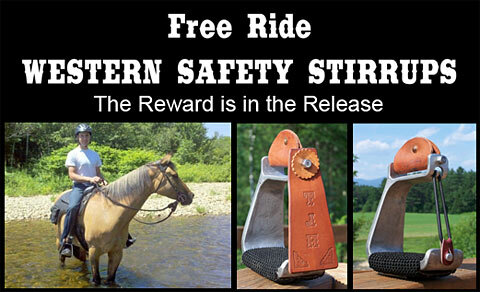 What Kind Of Warranty Come With The Free Ride Western Safety Stirrups? We give a lifetime warranty on the structural components of our stirrups. If the body of the stirrup EVER breaks or deforms, we will replace it free of charge! We have complete confidence in our American made stirrups and back them 100%! In fact, when you receive your stirrups, and you are not satisfied with them for any reason, simply return them and I’ll refund your purchase price! What Do Customers Say About Western Safety Stirrup? The most comfortable stirrup I have ever ridden in! I put a pair on my trail saddle and absolutely LOVE them! I am ordering another pair to put on my barrel racing saddle! My stirrups arrived and they are even more beautiful than I expected! The custom carving you did was exquisite! The bonus is the peace of mind I have while riding in them! Thanks so VERY much! I just wanted to let you know how much I am enjoying my new Free Ride Stirrups. I ride alone a lot and the confidence and peace of mind they provide make my rides SO much more enjoyable! On top of that, I cannot believe how comfortable they are! You have done a remarkable job in designing such a wonderful product! Good luck with your new enterprise! I am sure you will do well. Order Your Free Ride Western Safety Stirrups Today! Your life is literally riding on your horse! Even the best trained horses can have a bad day, slip, spook or fall in such a way that causes a rider to loose their balance and slip their foot through the stirrup. Our stirrups are designed to break free in those situations, thus saving lives! Don't risk your life-- enjoy the beauty and the peace of mind that comes from the Free Ride Western Safety Stirrups and to place your order, please call, email or visit our website today!